(A Journey from her mother's perspective). Congratulations! It’s a bouncing baby Zebra! There’s a saying in the medical field, “When you hear hoof beats, look for horses, not zebras.” The term “zebra” refers to an unlikely diagnosis. For example, a patient presenting with an annoying cough is most likely suffering from a viral infection, not tuberculosis. Allow me to introduce you to our Zebra. Sydney was born in January of 1997. Perfect pregnancy…not so perfect delivery. She came to us by emergency C-section. A surprise breech presentation. The hoof beats begin faintly in the distance. I’m a firm believer that your children’s’ personalities are evident at birth. Sydney started life mooning the world. Some things never change! She was a determined, strong-willed child from the beginning. In fact, I read James Dobson’s “The Strong-Willed Child” – twice! Sydney was your typical tom-boy. Loved being outside. Loved frogs. Loved her rodent-pets – and we went through MANY. Around the age of 10, she refused to wear anything but t-shirts and basketball shorts. I picked my battles. One summer at the waterpark, my mother asked me why Sydney was standing awkwardly – arms crossed, hip popped, shoulder shrugged…. I just assumed it was pre-teen attitude. Not wanting to be out-mothered by my mother, we had Sydney examined. Hoof beats were growing louder. She was diagnosed with a fairly significant case of scoliosis. I was nominated for mother-of-the-year for missing the signs. Sixth grade and we embarked down roll-cage road. She was fitted for a brace that she was to wear 23 hours a day. Although considerably better than the braces my friends had to wear in the 70s, it was still limiting and a huge blow to her fragile pre-teen self-esteem. Being the stubborn child she was, she complied pretty well. We had a few minor setbacks, but to our knowledge, she was mostly compliant. Now that she’s an adult, she may wish to tell us otherwise? Sydney had started playing soccer at the age of 3 and was able to continue to play – sans brace. She chose the position of goalie, much to the dismay of her anxiety-ridden mother. 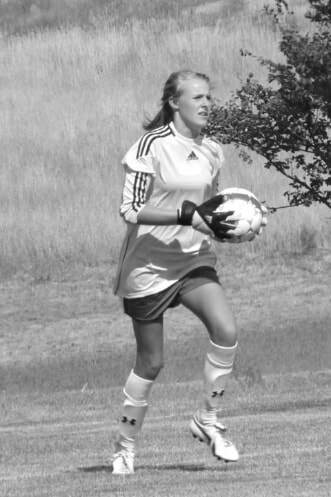 She made the Junior Varsity team as a seventh grader and was on track to move up to varsity when the seasoned goalie graduated from high school. After a strong start on varsity, her skills started slipping. She was having trouble catching and throwing the ball. Queue hoof beats. We again blamed the attitude and thought she was just burnt out on soccer and had lost her drive. She started complaining that she couldn’t feel her right pinky finger. She had a callus on her knuckle that she constantly chewed on, causing infections. I kept telling her to quit gnawing on it and it would heal and be fine. A few months later while eating pasta for dinner, I watched her attempt to cut her ravioli with both hands pressing on the fork. She would then use her left hand to pry her right hand from her fork so she could adjust her grip and take a bite. It was clear to us now that this was more than an infected callus. We put the callus-horse out to pasture and rounded up the ulnar nerve horse. Our thought process was that she had elbow and ulnar nerve damage from years of playing goalie and diving onto her elbows. Shortly thereafter, our dear family friends were over for dinner. I had confided my concern about Sydney to Mrs. Family Friend. Mr. Family Friend also happened to be Dr. Family Friend, the local orthopedist. The very laid-back orthopedist. Mrs. demanded that Doctor look at Sydney’s hand. He took her right hand into his and a look of shock came over his face. This was not the type of reaction we typically saw from Doctor. He examined her hand further and noted a fairly significant degree of atrophy. He directed us to get her into the Physiatrist as soon as possible. Hoof beats, louder yet. After accepting my second mother-of-the-year award for missing yet another sign, we get Sydney in to see our new, young, progressive Physiatrist. He performed an EMG, which is a test to determine which nerves are experiencing issues. He positively concluded issues with the ulnar nerve, however, he also noticed deficits with the radial nerve and the nerve above the elbow. He referred us for an MRI to look for cervical disc issues. Sydney and I met up at the hospital for her scheduled MRI. Typically, this procedure lasts about 30 minutes. About 25 minutes into the procedure, the nurse came to find me. I expected her to tell me that Sydney was about done and I could come get her things ready to go. Instead, she asked me to give permission for them to administer contrast so that they could extend her MRI and examine her more closely. I knew enough to know that they don’t administer contrast just for fun. That told me there was something there that they needed to explore further. I started quizzing the nurse, who appeared very flustered. She nervously took me down the hall to the radiation technologist. It was like “Dead Man Walking”. Those 30 feet felt like 30 miles. They told me to call my husband to come to the hospital. I had just been trampled by a herd of zebras. We were no longer thinking ‘elbow’. We were no longer looking at horses. The nurse left me with the rad tech. They took my husband back with the radiologist. I stared at the image on the screen and at an enlarged white mass at the base of Sydney’s skull. No one was talking. I finally said to the tech, whom I knew, “I AM FREAKING OUT. WHAT IS THAT? !” Having sensed my fear, the tech kept repeating, “It’s not a tumor. It’s not a tumor. It’s called a syrinx.” A what? He directed me to a computer in the corner of the room to learn more about it. My husband joined me as Dr. Google helped us learn more about this black and white striped beast which we now were forced to confront. The tech wasn’t being rude. The radiologist wasn’t ignoring us. This was truly the Zebra. 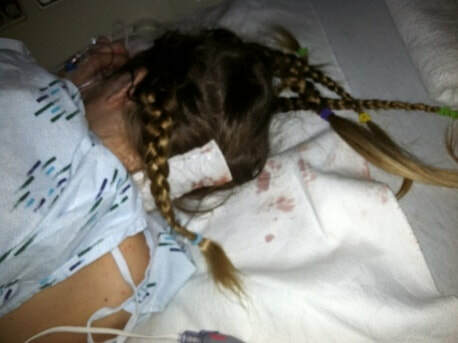 Sydney was diagnosed with Chiari Malformation, Type 1 as well as syringomyelia – a rare condition. Chiari Malformation is a condition where brain tissue herniates down into the spinal column causing a restriction in the flow of cerebral spinal fluid. This restriction in fluid flow can cause the formation of fluid-filled cysts within the spinal column. That condition is called syringomyelia and the cysts are called syrinxes. In Sydney’s case, the syrinx was quite large, running from the base of her skull to her mid-back. These cysts have subsequently caused irreversible nerve damage affecting the right side of her body – particularly her right forearm and hand. She has what’s called a ‘claw hand’, where her fingers are perpetually curled inward. She has no feeling on the outer part of her right hand and arm and decreased sensation all along the right side of her body. Her balance has been greatly impacted, resulting in frequent falls. So, why do I tell you this story? For three reasons. First of all, medically speaking, if your child or any child you know is ever diagnosed with scoliosis, please ask your physician to administer a simple neuro check at each appointment. Chiari Malformation and its associated ailments are only diagnosed through MRI right now. It is not feasible to scan everyone with a scoliosis diagnosis. However, a simple neuro check can easily be performed at no additional cost. Would this have prevented the Chiari? No. But it could have potentially identified an issue long before irreversible nerve damage occurred. The surgery would likely still have been a necessity, but we could have had the procedure done much earlier in the process. Secondly, while the world is filled with horses, there are still a significant number of zebras out there. I mentioned volume II to this story…. the cliff notes version is, if you are blessed with a zebra, be your own advocate. Leave no stone unturned, tap into any and all resources available to you and keep calling, emailing, knocking until you get access to what you need. We were fortunate to connect with an amazing surgeon and great medical care, but it didn’t just drop into our laps. Working across health systems was a huge challenge. Huge, but not insurmountable. People are inherently good and will help you. Trust me. To the unknown woman in an out-of-network healthcare system who took pity on me – a fellow mother – and helped me when my phone inquiry was wrongly transferred multiple times, God bless you. You gave me the strength to keep going. And hopefully our story will help give someone else the strength to keep going. And finally, I know there are many other ‘mothers-of-the-year’ reading this who beat themselves up because they didn’t see the signs or recognize the symptoms of their zebras. Let me ask you this…. How many stripes does a zebra have? Answer – you don’t know what you don’t know….. until you are close enough to count. It’s not what you do when you don’t know – it’s what you do when you do know. So, what now? How’s Sydney? What are the long term effects? That remains to be seen. Sydney is now a senior in college and hopes to pursue Clinical Neuro Psychology. Hmmmmmm. Wonder what influenced that decision? Even though I failed the mother-of-the-year test multiple times, I do know one thing. That ‘strong-willed’ child hasn’t lost her fight. Between her strength and her experiences, she will be the best Clinical Neuro Psychologist ever! And we will be behind her 100% of the way. Contact us by email today at wstfcure@wstfcure.org. You will be required to sign a release form giving us permission to share your story. You can download it here: WSCTF HIPAA Media Release Form. 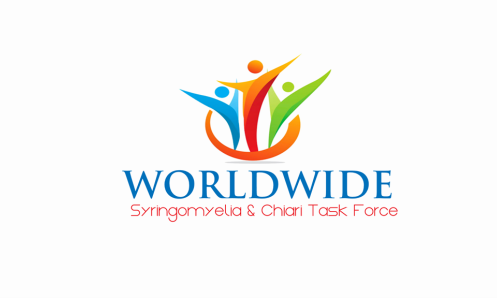 We are looking for member journeys about the hardships, triumphs, and struggles of living with Syringomyelia and Chiari. We are looking for caregiver stories about taking care of a loved one with Syringomyelia or Chiari. We are also now accepting stories about owners and their canines with Syringomyelia. We will also consider video submissions. We encourage stories to be between 400-1200 words. Please make sure you edit your story. All photos submitted must be in JPEG format and at least 300X500 DPI. We will NOT publish any negative opinions about doctors or negative comments about other related support groups. All stories must tell your journey in an informative manner. We have the right to reject any submission for any reason. Ready to submit a story? Click here to contact us.